Leads are arguably the cornerstone of your business. If no one is interested in the information you put out ... if you don’t have anyone on your email list ... if you don’t have people lining up to purchase your product or service, do you even have a business? Not really. It’s the acquiring leads part that takes some strategy. So, how should you go about it? The truth is there are many ways to generate leads for your business — opt-in forms, live events, email campaigns, social media, the list goes on. Paid advertising is one way to go about generating leads, and quite an effective one at that (if done right). 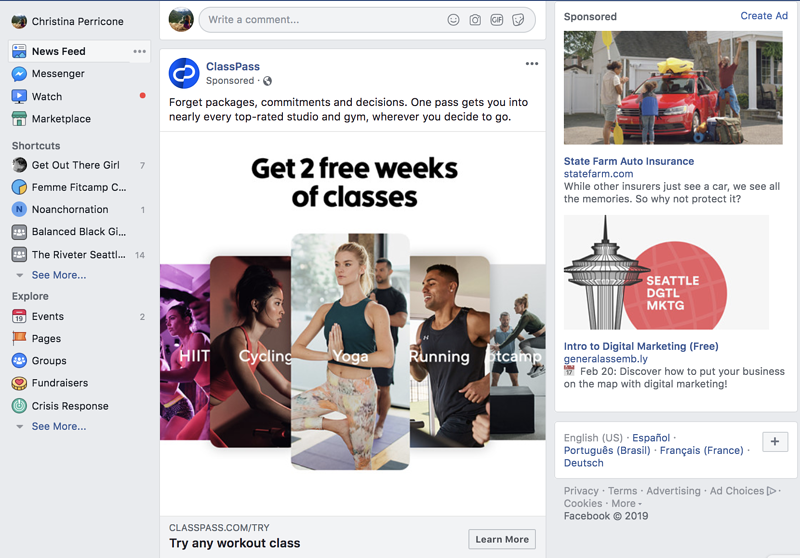 Facebook Lead Ads offers a way for you to advertise to your audience on two of the most popular social media sites — Facebook and Instagram. Facebook Lead Ads doesn’t need to be the only platform you use for your paid strategy, but we’ll cover below why it’s not one you should leave out. 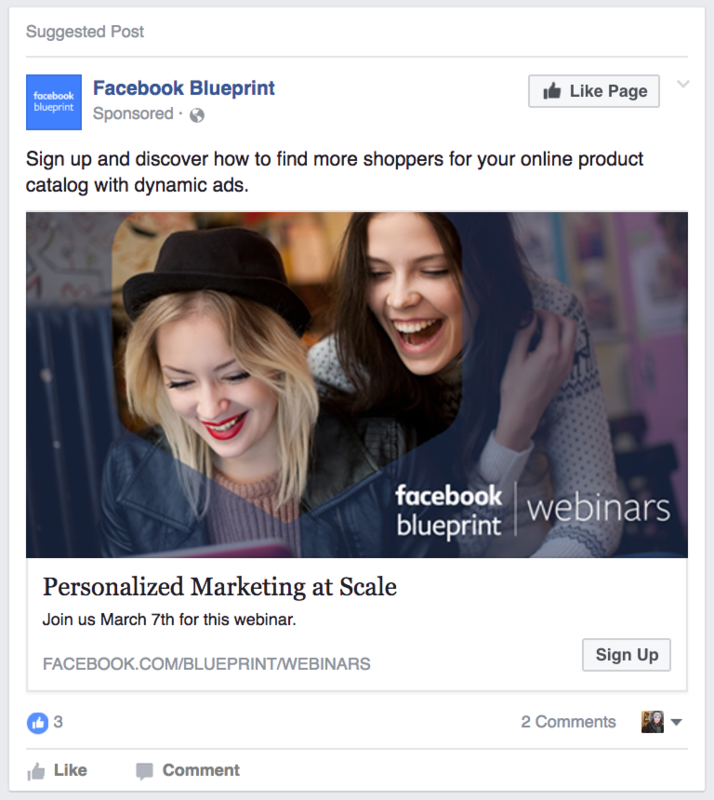 This guide will take you through how to set up and optimize your Facebook Lead Ads, provide you with some audience targeting techniques, and give examples of effective paid ads that you can follow. Let’s begin with a simple definition of leads and an overview of lead generation. A lead is a potential customer who has expressed interest in your business, product, or service by completing some action. That action might be filling out an opt-in form, reaching out to you at an event, or some other engagement. What designates them as a lead is that they explicitly offer their personal information (e.g. name, email, phone number, etc.) to you in exchange for some valuable information. If leads are people who express interest in your product or service, lead generation is the process of attracting and converting visitors into leads. For us marketers, that means finding ways to get potential leads interested in our products and services. We know that lead generation isn’t about blasting product messages to the world. Instead, finding leads is about providing your audience with useful and relevant tools and information to help them solve problems — i.e. problems that your product can solve. When you do this, you attract quality leads that will likely end up becoming customers. Think about it in terms of the flywheel. Your prospects will go through what’s known as the buyer’s journey, which consists of three phases that eventually result in a new customer. Phase one, or the awareness stage, is when you attract strangers to your business by providing useful content. Phase two, or the consideration stage, is when these strangers begin to like and trust you over time and eventually convert into leads. The final phase, the decision stage, develops as you nurture your relationship with your leads until they become customers. The buyer’s journey will be useful to keep in mind as you set up your Facebook Lead Ads. 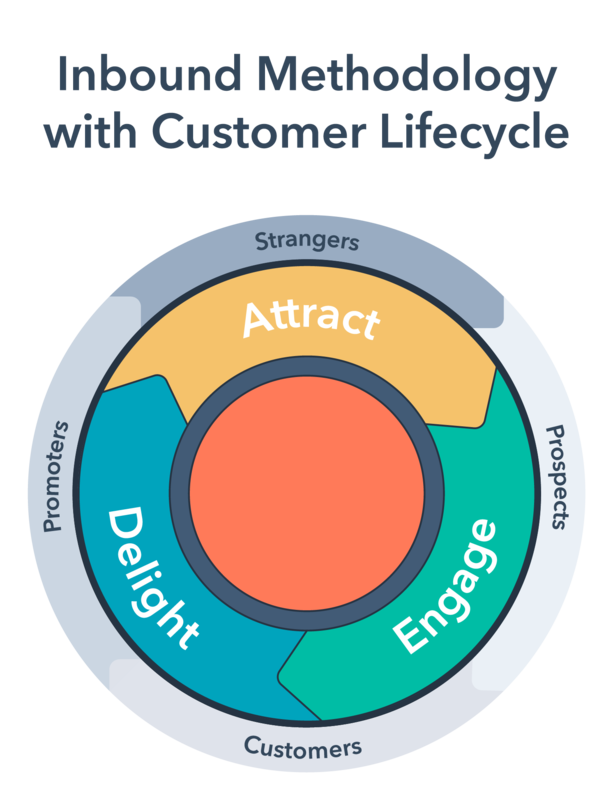 Now that we’ve covered the customer lifecycle, let’s talk about how you get leads. This is a simple version of a lead form — yours might have a few more fields. Regardless, the practice of using lead forms is pretty simple. Here’s an example of how it works at HubSpot. Check out our form builder that’s designed to generate leads. First, we create an awesome piece of content to use as an offer that potential leads might want to read. 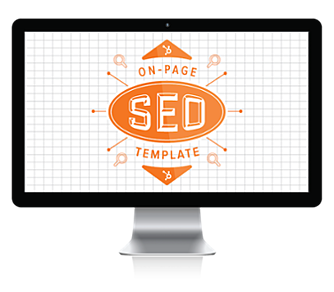 For example, an On-Page SEO Template. We always aim for a piece of content that syncs up well with a segment of our target audience — digital marketers looking to use SEO strategies to drive demand for their business. Next, we create a landing page that gates the piece of content. “Gating” is just a term for requiring the user to submit information through a form in order to receive the offer. Once the user submits their name and email address, that data is stored in our customer relationship management (CRM) tool, which allows us to send more relevant information and qualify them for our sales team, if applicable. Lead forms are standard practice. And you can use them anywhere to generate leads — even on social media sites … which brings us to Facebook Lead Ads. Why target leads on Facebook? As marketers, it’s our job to meet people where they’re spending their time, not the other way around. Facebook has 2.32 billion daily active users, which means your potential customers are likely active on the platform. With so many people using and interacting with Facebook every day, the social site is a great online space for you to generate leads organically or through paid promotions, making marketing on Facebook ideal for getting leads in the door. Looking for a way to capture lead information on your website for free? 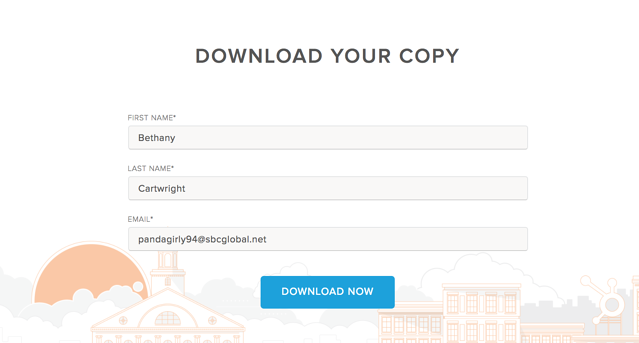 In a traditional lead generation conversion path, users are driven to a landing page where they fill out a form. They might have first interacted with your information via an ad or post on Facebook, for example, and then in order to input their information, they were required to leave Facebook altogether to go to the landing page on your website. This method can be great for finding high-quality leads since you’re attracting people that are willing to go through the effort of abandoning what they’re doing to fill out a form to obtain your offer. But what if someone is only mildly interested in your offer, which may be the case if this is the first time they’re hearing from or about you? They may not want to take the time to leave Facebook just to fill out your form. 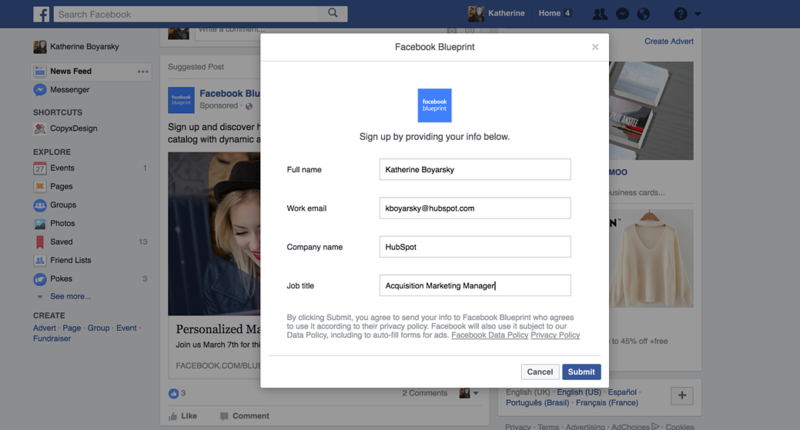 Facebook Lead Ads allow users to stay on the platform to submit your lead form. Instead of sending users to an external landing page, prospects can access your offer without ever leaving the Facebook app, which is key for increasing conversions. This means you can capture lead information from the Facebook platform and avoid the friction of a longer click-through path for the user. Facebook Lead Ads work similarly to any other paid ads. First, you set up an ad through Facebook’s Ads Manager. You can customize targeting features, creative assets, and budget to make sure the ad reaches the right audience. Facebook then uses the information you entered to show your ads to people that could become your potential customers. The ad is displayed in a user’s news feed — it looks similar to an organic Facebook post but is designated as a “sponsored post”. Lead Ads work through the promotion of a lead generation offer. For example, say your business wants to increase the number of signups to your product — your offer might be a discount coupon code. Like any other offer, the user has to submit their personal information through a lead form to access the code, except with Facebook Lead Ads — this form lives within the Facebook app. 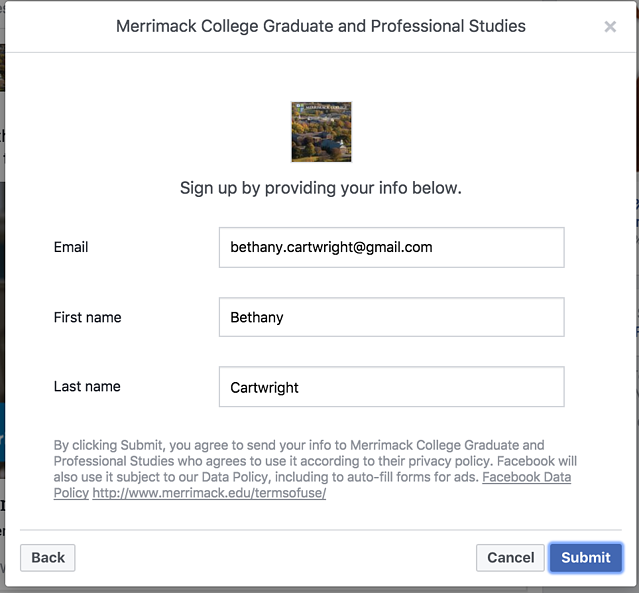 When a user comes across your ad and clicks the CTA, Facebook will display a form that is auto-filled with their information (a great way to reduce friction when signing up since they have less form fields to complete). Your Facebook ad will then deliver the code in app via a Thank You message or via email, depending on how you designate the lead flow. Now your new lead has your discount code, and you have a new potential customer to nurture and qualify. Take the free Facebook Ads course taught by HubSpot experts. Facebook Lead Ads have a few important benefits for both you as the advertiser and your prospects. When asking a prospect for personal information, it’s important to remove as many barriers as possible. Facebook Lead Ads helps you meet your audience where they are. Native Functionality. With Lead Ads, users can submit their information through an auto-filled form without ever leaving the platform. You avoid disrupting the user experience by keeping your lead on Facebook instead of switching from the platform to your website and back again. Mobile Responsiveness. Facebook Lead Ads are particularly beneficial for mobile. The app is already set up for mobile users, so you can rest assured that your ads will be, too. That means that no matter on which device your potential leads are seeing ads, they will be able to complete your form without any issues. Simple Data Collection. Lead Ads are also beneficial for the advertiser because they capture potential customers’ information without having to create a new landing page or conversion path. Everything you need to obtain a new lead is in the platform, and that data can easily integrate with your CRM. Highly Targeted Segments. Facebook Lead Ads allows for highly targeted segmentation, like interests, demographics, and more. This means that the leads you acquire from your Facebook ads are already highly qualified for your product or service. 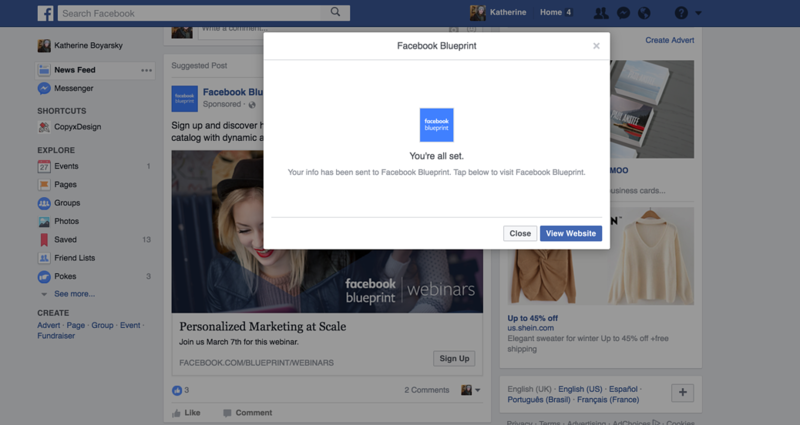 Now to the fun part — setting up your first Facebook Lead Ad. You already understand the benefits of using Lead Ads, so let’s get started. First things first, make sure that any form fields your company plans to use are in line with Facebook’s Lead Ads policies. Once that’s squared away, you’re good to start building your paid campaign. Then, run through the following steps in order. 1. Open your Ads Manager. This will be the most simple step. Login to your Facebook account, navigate to your Ads Manager. Then, click “Create”. 2. Select your campaign objective. Next, you’ll see a screen asking for your ad campaign objective. Since we’re creating a lead ad, select “Lead generation,” and the page will pull down with the next option. Note: You’ll see an option for “Switch to Quick Creation” in the upper right-hand corner. You can click this button if you don’t need to be guided through the creation process — this option is for the advanced advertiser who is familiar with Facebook Lead Ads. Otherwise stick with “Guided Creation”. 3. Name your ad campaign. We recommend being as detailed as possible here and include the campaign objective in the name so you can compare your results to the original goal. Next, you’ll move into your ad set, where you add demographic details about your target audience and select the options that correspond to your persona. Let’s cover tips for each of these options. Think of the ad set as the basket that is holding all of your ads for a specific persona. Your ad set name should reflect that, e.g. Shoemaker Sally - 25-34 - College Grad. Add as many descriptors as you need. Or, if you have a persona worksheet, you can simply give the ad set the name of your persona and reference the worksheet when needed. Use the drop-down to determine which Facebook business page the ad set falls under. Your company may have several business pages. If not, your page should already be selected. This option allows you to upload a variety of creative assets separately for Facebook to automatically generate the right combination of a headline, image, CTA, and other components to show to subsegments of your audience. Use this option if you’re not creating a complete ad image that you want to split test yourself. You can select all the characteristics and traits of your target person for this ad set, everything from age to interests. This is where Facebook’s unique segmentation proves useful — you can select an audience based on their interests, behavior or demographic information. You can also select to exclude people based on certain criteria so you don’t waste precious ad spend. Finally, you can select connections based on how people have interacted with your business in the past. As you add in more targeting features, the “Audience Size” ticker on the right will show you the total size of the audience you’re trying to reach. Facebook uses all of this information to choose who to send your ad to so you get the most return for your budget. We’re going to dive deeper in these options below in our targeting section. 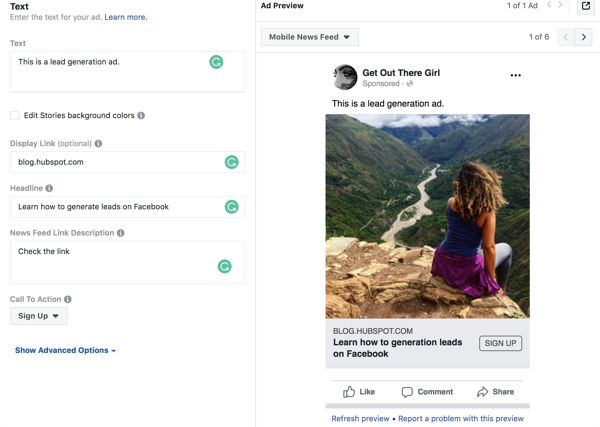 This is where you can determine where your ad will be placed, whether on desktop or mobile, Facebook or Instagram, in the feed or on the side column. 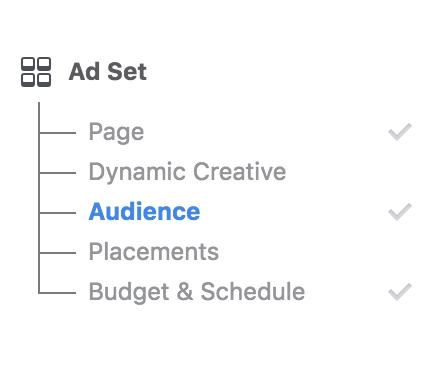 Facebook also allows you to select “automatic placements,” and they will determine where to place your ad based on performance. Your goal is to determine where your ad performs best, then place your ad there more consistently. You can achieve this in one of two ways: set your ad to automatic placement for a set period of time and analyze the results, or select the placement that best matches your target audience. For instance, a younger audience might spend more of their time on mobile, while a certain age demographic might spend more time on desktop. This is why knowing your audience is so important — you’re always making best guesses at first, before you test and optimize. This is where you can select the average you want to spend per day and how long you want your ad to run. Facebook Ads works on an auction system, so make sure to choose a budget that seems reasonable based on prior research. Some campaign objectives let you select whether you’d like to bid for cost per click (CPC) or cost per thousand impressions (CPM), but the lead generation goal is set to CPM. No matter what you choose, make sure to check in on your ad periodically to ensure that it’s performing according to your objectives. After this, you’ll move into creating your first ad. We’ll cover how to navigate this section and some best practices. This will be pre-selected based on your ad set, but if you’re advertising on Instagram, then you’ll need to include the account on which you want to advertise. You have two options here — carousel or single image. A carousel allows for two or more scrollable images with a variation of headlines. This is a great option to display multiple product offerings or to pique interest by displaying steps or parts of an image split into a carousel. A single image is as it sounds, or you can use it to display a slideshow within a single frame. Upload your creative assets here. You can choose between a video (yes, gifs count) or an image. You’re also allowed to upload up to six versions of your ad to be displayed. This is useful because you can determine which type of ad converts best — just be sure to make small changes to each variation so you can properly split test. Learn how to make Facebook Video Ads. Enter your headline, ad text, link description, and relevant URL here. 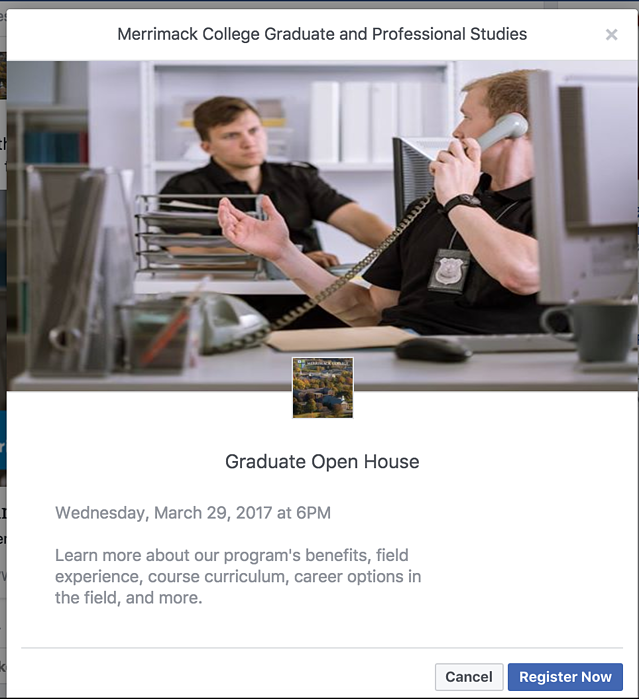 Facebook will generate a preview of your ad to the right so you can see how it’ll look in various placements. After this step, you’ll review your ad campaign and submit it for review. Once approved, your ad will start running and collecting leads. That is, what should your audience filters look like in the Ads Manager? 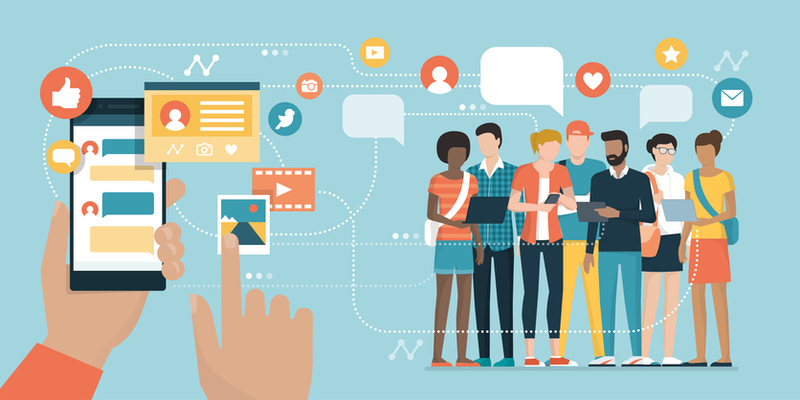 There are many different ways you could set up your audience targeting for a given ad campaign, and there are five filters you have at your disposal to do so: location, demographics, interests, behaviors, and connections. Each of these filters are within the Audience section of your Ads Manager. Use this setting to target users by a location where they live, have visited, or are traveling. You can also include locations outside of this area or exclude locations within it if they fall outside of your criteria. The point is to focus on areas where your potential customers are and exclude the rest to maximize your budget. For example, let’s say you own a retail store located in Connecticut and you’re willing to ship merchandise to Rhode Island and Massachusetts. You shouldn’t waste your ad spend on ads targeting people in California or even New Jersey for that matter. So, you would select “people who live in the United States” and include Connecticut and the two other states where you ship since those are the only consumers who would have access to your products. That said, if you own an ecommerce store, you can widen your parameters to wherever you ship products. Think about your buyer persona [Don’t have one? Click here to make a buyer persona.] and the target audience for your campaign. Are most of your current customers women? Are you looking to expand the market for your products among college students? Use demographic data like age, gender and language to hone in on your target persona’s characteristics. This is why knowing your persona is so important — Facebook Lead Ads help you preserve your budget by marketing to users who fit your criteria, down to their favorite drink. Interests will help you narrow your target to people who have expressed or shown interest in the thing that you are marketing. That is, if you own a bike store, your target might have signed a pledge to decrease their carbon footprint … or they just might be in the market for a new bike. Behavior-driven ads are some of the most powerful to use for lead generation campaigns. Someone who has expressed interest in your industry, product, or service in some way is more qualified to become a lead (let alone a customer). For instance, say someone recently read one of your blog posts or looked at a few products on your site. You can use behaviors to target your ads to them. You can also use this feature for more broad behaviors, like tablet users or people who have clicked any CTA in the app. The last primary category of targeting features is through connections. This is for users who are connected to your business in some way. That might include people that follow your Facebook page, have used your app, or attended your events. Use this targeting feature to include or exclude people already interacting with your brand, depending on the goal of your campaign. Now, let’s get into how to develop a targeting strategy for each campaign you run. It all comes down to setting a goal for your campaign and knowing your buyer persona inside and out. You’ll need to start broad then whittle down the details. First, decide on the target audience of your campaign. Is it a campaign that’s suitable for your customers — like a holiday coupon deal — or an offer that’s most relevant to people who not already aware of your brand? Segment accordingly. 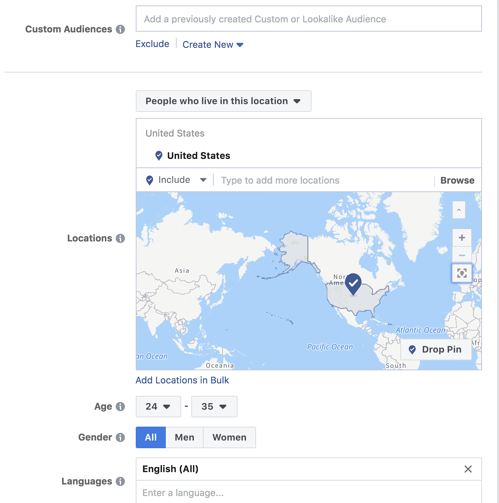 Then, use the demographic and connections tools to set targeting features based on what makes the most sense for the campaign. Next, use interest and behavioral data to narrow your audience down depending on the breadth of your budget. If you have a small budget, use narrower targeting features to try and reach the best prospects possible. If you have a larger budget, you can use broader targeting data. That said, you still want to target only those who are most likely to be interested in what you’re promoting. 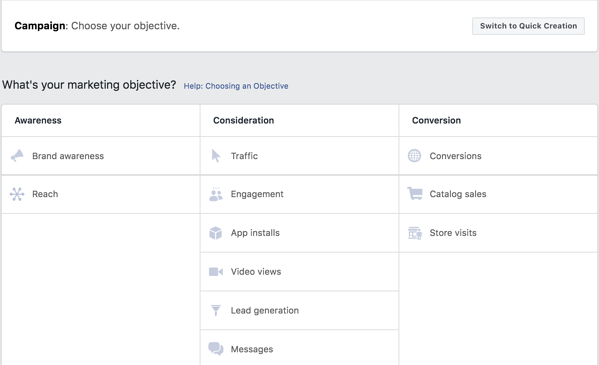 Learn how to optimize your Facebook Ads to get more conversions. Creating and publishing your Facebook Lead Ad is only the beginning. You’ll gain a better understanding of what works for your audience as your ad runs — that’s why testing, analyzing, and optimizing your ads is critical to getting qualified leads in the door. Below is a list of resources that will teach you what metrics to track, what those metrics mean and how to revise your ad strategy to hit your lead goals. Use these resources to learn how to optimize your Facebook page and your Lead Ads. By now you know how to set up your own Facebook Lead Ad and why it’s beneficial for your company. 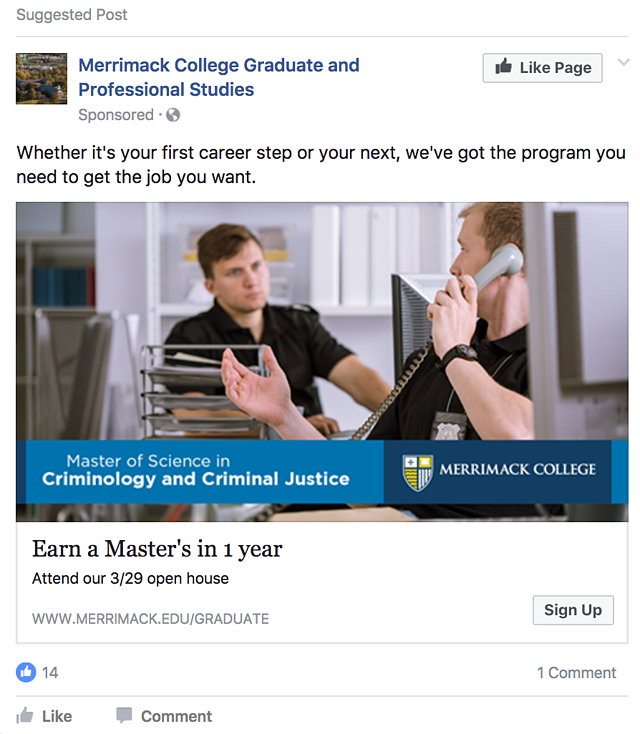 But what does a good Facebook ad look like to a user and how are these ads set up? Let’s do an exercise. Pretend you’re a Facebook user for a moment. Imagine scrolling through your newsfeed, looking through posts from friends, photos, and status updates. 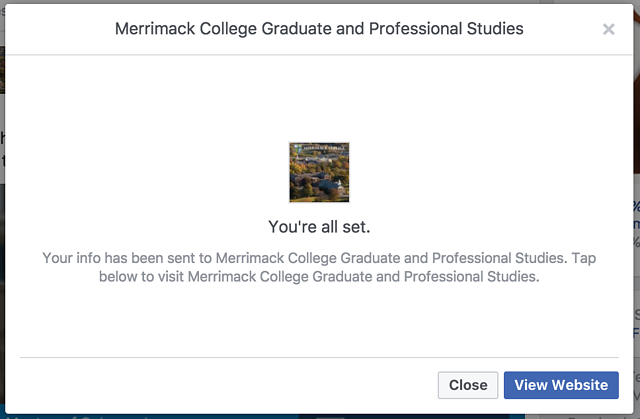 After pressing submit, a confirmation window appears and you’re given the option to click out of the pop up and head back to your newsfeed to resume scrolling. If you’re looking for more information right away, the ad flow also gives you an option to “View Website,” which directs you to a landing page where you can get more information about the company. As you can see, the lead flow user experience from a Facebook Lead Ad is much more seamless than it would be if your scrolling was interrupted to send you to an external website where you were asked to submit a form, then navigate yourself back to what you were doing on the app. Here’s another example of the superior user experience of a Facebook Lead Ad. Drive traffic, increase fan engagement, and save time on social media. We’ve covered how to obtain leads through Facebook Lead Ads, but what do you do with the information you received? Do you immediately initiate a follow-up call? Download a .csv file and analyze your data? So many options! The short answer — deliver what was promised, then nurture your leads. You can think of it as a courtship where you delight your lead into a closed sale. That is, you follow up with relevant information, ask for feedback, answer their questions and engage them until they decide that you’re the best option to solve their problem. This is all part of your marketing flywheel, where the more value you provide, the more trust you develop with your new lead, and the more likely they are willing to buy from you and recommend you to others. You need a place to store your new leads and a system that makes it easy to follow up with them. While it would be great to email each new lead individually, that becomes a problem with a successful Lead Ads campaign where you generate hundreds or even thousands of leads. Customer Relationship Management (CRM) systems, like HubSpot, allow you to store, track, monitor, and keep up with leads so you can nurture them effectively. 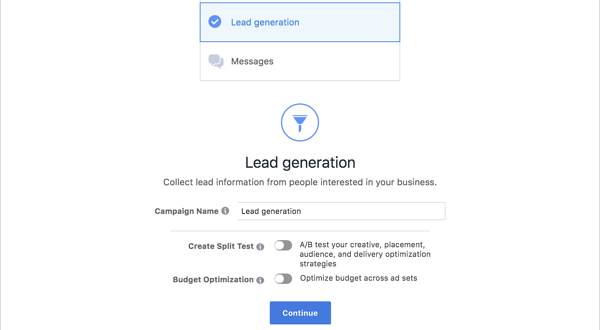 Many CRMs allow you to connect directly to Facebook Leads Ads so that every time you obtain a lead from your campaign, it’s sent directly to your CRM. This option frees up your time for optimizing your campaigns and delivering value to your new leads. Try our free CRM to manage, track, and engage your new Facebook leads. Once you’ve synced your new contacts to your CRM, your marketing and sales team will be able to appropriately nurture and follow-up with them based on the ad offer that they signed up for. Facebook Lead Ads isn’t as mysterious as you may have thought. With a clear buyer persona, a specific targeting strategy, and a reputable CRM, you should be able to obtain all the leads you need to reach your potential customers and grow your business.